Saint Patrick’s Day has always been a fairly low key day for me. I’m not a big fan of parades and I’m not a big fan of excessive drinking either so that immediately removes two of the key elements from the equation. That’s probably why my favourite St Patrick’s Day memory has nothing to do 'shamrocks' and 'crock’s o’gold' and such. In fact, for probably the last time, it’s that movie again. On 17th March 1981, I was living in Sherrard Street in Dublin and going to college. 'No college on Paddy’s Day though, so the choice was go to Mass or go to the Parade. The Parade was quite good… for a parade. But afterward, the families all dispersed, the shops all shut, and ‘The Flight of The Doves’ was on the telly at home. There was nothing else for it, it simply had to be a movie. Luckily there was a new film just released that I wanted to see and it was on at the Screen on The Green. I walked through the dregs of the revellers in the beaming afternoon sunshine. The cinema was deserted except for the ticket lady. I bought a ticket off her and went in. There was nobody to check my ticket, the shop was closed-as-hell. The cinema was pitch dark. I stumbled into a seat which was thankfully empty. As the gloom cleared I saw that finding that empty seat was no great trick, the whole auditorium was completely deserted. I watched the previews and the ads and waited for some other people to come in but nobody ever did. A short while before the feature was due to start, a phone started ringing somewhere in the building. Nobody rushed to answer it. Fearing that it would spoil the movie , I went and found the phone in a little empty office and answered it myself. I checked a chart on the wall. Then I went back and watched the movie, all alone in the huge cold theatre on St. Patrick’s Day 1981. Man, I loved that movie so much that day. I’d offer a prize for someone to name the film but that would just mean that the answer to every quiz I ever did here would be ‘Body Heat’. Have a happy St. Patrick’s Day - whatever you may do. Too bad I can't post under an assumed name. I could go with Margaret Mary May Philippa. The last for my Grandmother. Happy/ Merry St. Patrick's Day to you. May all your movies be in green. May all your fish be gold, even the dead ones. May all your limericks be blush-worthy. I watched a couple of movies all alone like that in the theatre. I loved it. Just being alone is priceless! I didn't answer the phone though. That was a nice touch. Happy St. Patrick's Day! my first born name is Patrick, I named him after the church in San Francisco California,St. Patrick Catholic Church, it was also the first church that i went when i came to US.I knew a li'l abt the St. but didn't know a thing that he is a patron of Ireland. Colette: I think being alone in a cinema happens a lot more in the age of the Multiplex. Back on Paddy's day 1981, I think it was the contrast between the warmth bustle of crowd of O'Connell St on Paddy's Day with the coolness, silence, and solitude of the Film Noir. Laura: The phone thing was completely surreal. If you ever see 'Once Upon a Time in America' where the phone rings disconcertingly over a number of early scenes, well, that always reminds me of Paddy's Day at the movies. Happy St. Paddy's Day to you, Ken. I hope you have a peaceful one. I had to stop by and see how my favorite Irishman was doing on St Patty's day. You made it so worthwhile with this story about a favorite movie. Much better than a big-city parade, definitely. I hope this holiday was as lucky for you as that one was. We had to take our kids to the village parade because they were in it, but we all had fun anyhow. I'd have preferred a day in bed, but you take what you can get I suppose. There are similarities with Danny Boy - death, grave, etc. - what I like about these songs, is that they do not depict death as something morbid. The Irish spirit must be formidable, like you - a humble, kind hearted and good man. Are those bagpipes in the background music? Have a happy St. Patrick's day with your loved ones. Take care and God bless. I love going to movies on a Monday at 11:00 am for the first show of the day....I usually have the theater 100% to myself. It's really cool. The last movie we went to, the surround sound was turned up so loud to get over the noise of the crowd, it made my ears hurt. I saw my husband patting the arm of the empty chair next to him as he became increasingly agitated. Leaning over to ask what was wrong, he suddenly got a grin on his face and started laughing. Worrying that the noise had driven him insane, I gave him one of those "O..kay" spousal looks and waited for an explanation. "I was reaching for the remote...to turn the sound down," he laughed. Ah, I love the solitude of matinees. Jenn: I had a really nice Paddy's Day, thanks. The weather was a treat. Debbie: Thanks! :) Yes, I have all those things you wish me and I could wish for nothing more! Hope: There really should be a remote for the Matinees, wouldn't that be good? hahahahahahahahah March 17 1981... I wasn't alive yet then. To me it still seems bizarre that anyone born in 1980-whatever is actually out of school already. Ah, they grow up so fast these days... *sniffle*. Next thing Reggie will be asking to borrow your car. Not mine! Don't want those kids tooling around in my insurance mobile. PS- I'm here... Where is your next post? Ken-It's taken ages for me to get here, but here I am. I gasped when you mentioned "Flight of the Doves", for you see over here nobody seems to recall it and I saw it as a 12 year old in the theatre and loved it! It was on the heels of "Oliver!" because Ron Moody had played Fagin and he was the disguise-master villain in FOtD as well as Jack Wild, who had been the Artful Dodger. I love it, I tell you! I can't seem to find it anywhere. I still remember the song, "You Don't Have To Be Irish, To Be Irish" (and being glad that I actually was). I have seen "Body Heat" a number of times and I did enjoy it, but not nearly so much as you (who could)? As well, it's funny that you have the Sinead O'Connor video because I was thinking the other day that I forgot to mention her in that post about Irish music and what must YOU be thinking? There you go and play one of my favourite songs too. I love that particular album. Laura: Reggie you can drive my car, yes you're gonna be a star... sorry, that tune is doubtless before your time. Laura: New post soon, all about CMF Adverts. There's a new one every three days, that's how we roll around there here parts. Ewwww. I'll take what's behind curtain number 1! I love the deserted cinema story so very much. It's the phone-answering bit that gets me. And I've still never seen "Body Heat". Nor indeed "The Flight of the Doves". Deserted Cinema is a great story, existential, no doubt. There is a certian romantic quality to being alone while everyone else is busy with deluded celebrations of a Saint who they never knew only as a myth. Endearing, you escaped the madding crowd and had some peace and private quiet that must have been very enjoyable. Fiendish: Glad you like it. Empty cinemas are more commonplace today but the phone does keep the memory special. McGuire: Finger on the pulse as always. It's the silence and solitude, away from the sunny bustle, that appeals to me too. Hi Ken, That is a lovely post. 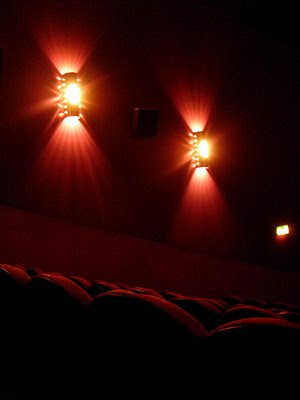 Quietness is precious even at a cinema. You should collate all of your posts in a book, I'd buy it and read it over many times.